Buying a $US5 Double Chalupa Box – or simply mailing your information on a postcard to a certain PO Box, detailed below – gives you a chance to win a limited-edition Xbox One X. This exclusive Xbox One features a platinum finish, a matching Xbox Elite wireless controller, and best of all, it plays Taco Bell’s famous “ring” when powered on. In unrelated news, I’m currently standing in line at Taco Bell for a $US5 Double Chalupa Box. As someone who owns a PlayStation 4 and a Nintendo Switch, I’ve never felt the need for more video games, so I hadn’t given much consideration to Microsoft’s Xbox One. 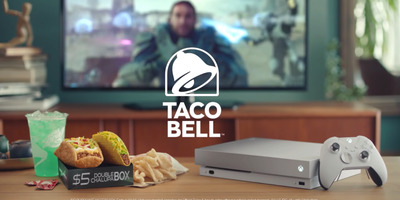 If you buy Taco Bell’s $US5 “Double Chalupa Box” – which consists of one double chalupa, one crunchy taco, cinnamon twists, a medium drink, and a humbling sense of regret – you’ll get a code that you can text or submit online for a chance to win a limited-edition platinum Xbox One X. In addition to the console, you’ll also get an Xbox Elite wireless controller – in that same platinum finish as the console, which is, again, exclusive to the promotion – and a pair of 3-month memberships to Xbox Game Pass and Xbox Live Gold. All of this has a total value of around $US600. Now if you’ll excuse me, I need to buy a few dozen Double Chalupa boxes. No reason.